Shop update tonight. But first…. 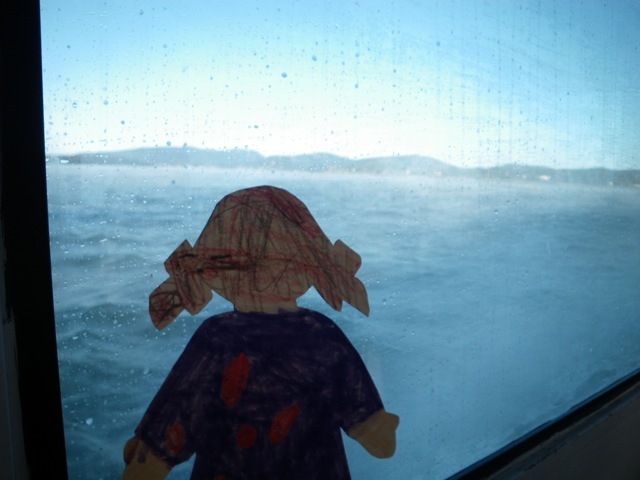 Flat Stella and I have to go off the island. Actually, Stella is on her way to visit her great Aunt Zsash in Oregon, leaving the island in an envelope. Now that’s a coast to coast visit! 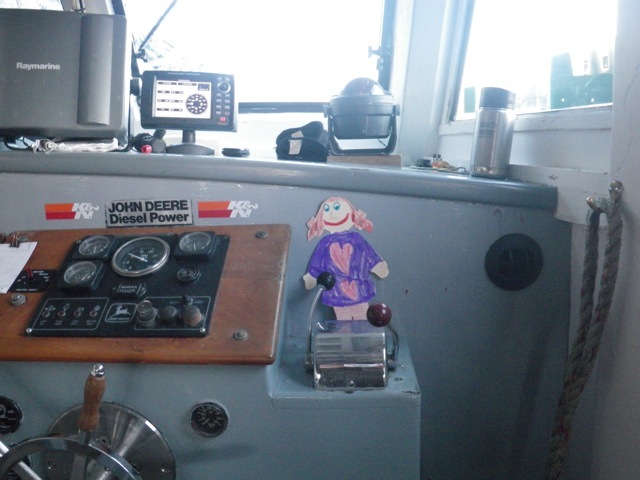 But last week, Flat Stella accompanied me on a visit to my mom. 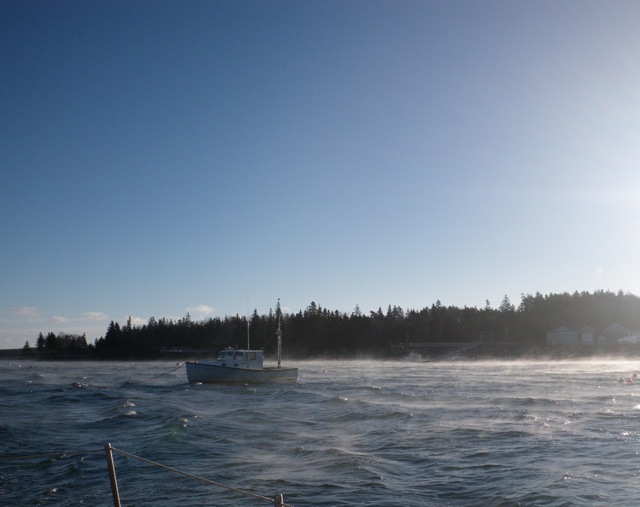 It was so cold out there was vapor rising from the sea. Stella visits with my Mom. I’ll be doing pretty much the same thing today, but unaccompanied. Also the weather is warmer, (oooh 20° is a heat wave!) so there will be no vapor or “sea smoke” to see. xoxo She was a good sport! Yep..loved seeing your mom with Stella! Stella was such a great excuse for taking photos! Wow Mom Wow! Love the photo! And we are very excited about a visit from Stella! She will have some great stories to tell – will that require a paper comparing the northeast and northwest coasts? Yes, you will need to write a research paper before sending her back to Chicago. hahahahaha Have fun! 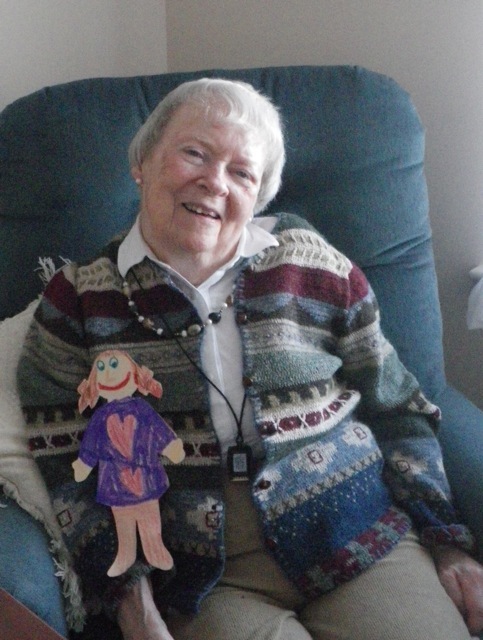 Flat Stella has quite the visit with you and she looks very happy with your gorgeous Mum. Yeah, I miss Stella already! But it made my day today when a table of 8 octogenarians (and some nonagenarians) all stopped their bingo game to practice giving the “royal wave” to me as I walked by! Classic moment! I love your mother’s sweater. Really pretty. Stella had to go back to school in Chicago. By way of Oregon. Yup.Mom’s looking pretty good lately. I always love seeing her in that sweater. I’m sure it’s an Oregon research jaunt for Stella? The sweater has great colors for your mother. Matches the chair and wall pretty well, too, which prob makes it look even better – no clash w/ imminent stuff to crash the vision process. Your mother has a beautiful face.